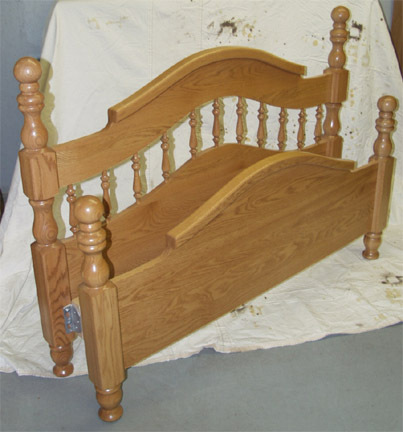 If you’re looking for something a little more basic, check out our solid oak bed frame featuring a nice smooth curved top design and spindles in the headboard. Sturdily built of solid oak by the Amish, this bed frame is the perfect addition for someone looking to introduce the beauty of solid oak into their bedroom without buying a whole bedroom set. The frame is shown here assembled with spacers in place of the rails so it takes up less space in the showroom, but you can still see how the two pieces will go together when assembled. There is also an option on this bedframe to have a raised panel type of design on the footboard. It is available in full, queen and king sizes, and the bedding is not included. As shown, in solid oak. Headboard, footboard and rails.